The Energy and Resources Group presents research and teaching talks by the five candidate finalists for the Environmental Science faculty position with ERG. The research talks are a part of the ERG Colloquium Spring 2015 series. 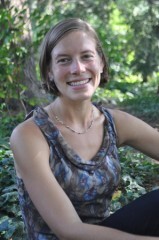 Sarah Batterman studies nutrient and carbon cycling in terrestrial ecosystems, and is interested in how ecosystem patterns emerge from the properties of individual trees. Her Ph.D. research focused on symbiotic dinitrogen fixation in tropical forests. It found that nitrogen fixation can be constrained by an interaction of nitrogen and phosphorus in the soil, and that fixation supplies a large fraction of the nitrogen needed to support the carbon sink in young forests recovering from disturbance. Her results show that individual trees and species differ in their nutrient strategies and in the timing of their contributions of nitrogen fixation to the ecosystem during secondary succession. These findings suggest that biodiversity is important for the function of fixation and for the carbon sink in tropical forests. Sarah continues to study fixation in the tropics.